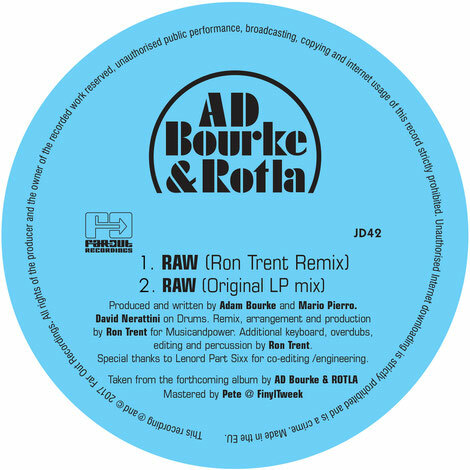 Far Out Recordings present a new track from Italian duo Ad Bourke & Rotla (Raiders of the Lost Arp), with a remix from Chicago deep-house artist Ron Trent adding extra intensity to the aptly titled ‘RAW’. Aiming to confirm themselves as Rome’s premiere polymaths for all things electronic and funky (with releases on Space Dimension Controller’s Basic Rhythm, Five Fold, Cinite, Tusk Wax and Really Swing) AD Bourke & Rotla’s musicality and approach to sequencers, samplers, drum machines and synths, has seen support from the likes of Dam Funk, Gilles Peterson, Benji B, Laurent Garnier, Jimmy Edgar, Martyn and Anthony ‘Shake’ Shakir. Taken from their forthcoming album for Far Out, ‘RAW’ gives you live drums, Rhodes noodling and synth layers, making for a hyperkinetic, organic, outer-national future-disco production. Taking a similar approach to that of his recent remix of Azymuth’s Fênix (also on Far Out), Ron Trent takes the track into harder territory, giving it an extra coat of slick, stripping back and tightening the original before adding his own layers of synth-lines and pad progressions.